Cf. 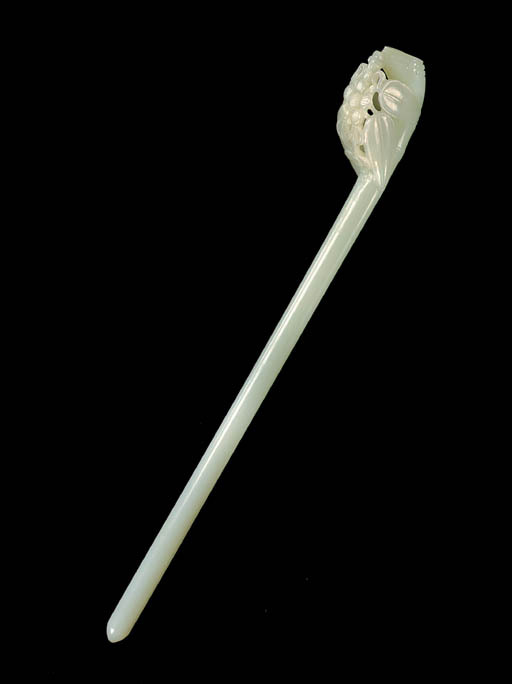 a similar hairpin in the standard late Ming form, illustrated by James Watt, Chinese Jades from the Collection of the Seattle Art Museum, Seattle, 1989, no. 53, where the author notes that the famous jade carver, Lu Zigang, of Suzhou, who was active during the second half of the sixteenth century, carved hairpins in a similar openwork style; and another included in the exhibition, Chinese Jade, An Important Private Collection, Spink & Son, London, 1991, illustrated in the Catalogue, no. 83.